Here's a nice sunny picture for the end of July! Still, snow looks better than rain. 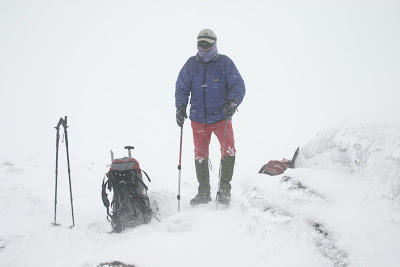 It was actually taken in February on the Cairngorm Plateau in a blizzard. The white streaks are horizontal wind-driven snow. I've posted it as a reminder of what conditions can be like in the Scottish mountains and why a good weather forecast can be invaluable for safe planning. For several years I've found the Mountain Weather Information Service (MWIS) to be the most accurate and the most detailed. This summer I've used it to grab sunny weather windows between the murk and rain, twice being on the tops before 5am in bright sunshine, then descending mid-morning as the clouds closed in. 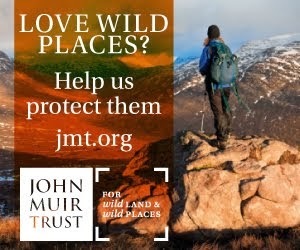 MWIS has been in need of funding for some time now and a campaign has been run to gain government support, with much good work being done by Roger Wild, the Safety Officer of the Mountaineering Council of Scotland, so it was with great delight that I learnt yesterday that the Scottish Executive is providing the necessary funds. The photo shows my companion at the top of the Fiacaill a'Choire Chais in the Cairngorms. Photo info: Canon EOS 300D, 18-55mm lens at 35mm, f8 @ 1/1000, ISO 200, raw file processed in DxO Optics Pro. This weekend sees the Outdoor Show in Friedrichshafen, Germany. It's the biggest outdoor trade show in Europe and the place to see all the new gear. I'll be there for four days, wandering the halls looking for interesting items and talking to myriads of designers, marketeers and PR people. Shows like this are exciting, entertaining and exhausting. I reckon a long day on the hill is far less tiring than a day at a trade show. I always need to go for a walk afterwards to recover. I like to go to the hills beforehand too, just to remind myself what it's really all about - which isn't gear. So a few days ago I climbed Ben MacDui in the Cairngorms by way of Loch Avon and Loch Etchachan on a day of much cloud and brief sunshine with spits of rain that only turned heavy ten minutes before the walk was over. The hills glowed and glowered under the clouds and flashes of sun, fresh with the green of summer and sparkling with water from the recent rains. I was surprised at how many snow patches remain, given the warm and wet weather of the last two months. Some were big enough for a few ski turns. Refreshed I'm now prepared for a long weekend inside. Actually it won't be totally inside as I'll be staying in a tipi in a village of such tents provided by Merrell footwear, which could be interesting. Once I'm back from Friedrichshafen I'll post an overview of the show. Test reports of interesting new gear will then appear in TGO over the next year. So far I've heard of interesting developments from GoLite, Terra Nova and Primus. I'm sure there'll be more. The photo shows the head of Loch Avon, Carn Etchachan and the Shelter Stone Crag at 14.30 on July 15. Photo info: Canon EOS 350D, Canon 18-55 lens @ 18mm, f8 @1/1 25, 2 stop graduated neutral density filter, ISO 100, JPEG. No post processing. A few weeks ago I was elected President of the Mountaineering Council of Scotland, a privilege and a responsibility that I am still coming to terms with. 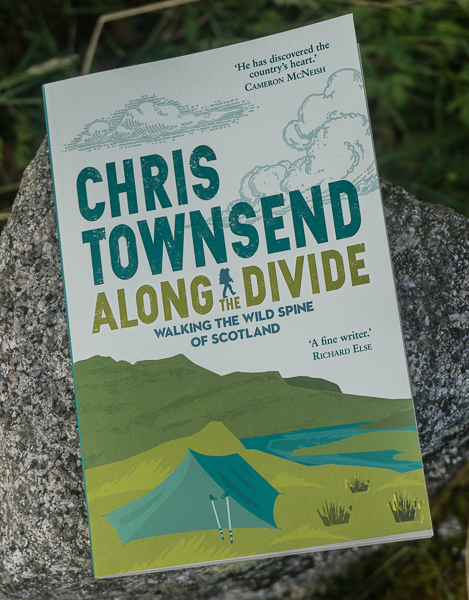 Yesterday I recorded a Podcast on the MCoS and my role with Cameron McNeish, the editor of TGO. The podcast can be found here and also downloaded from iTunes. We recorded the podcast sitting in the sunshine looking out across Rothiemurchus Forest to the Cairngorm mountains on the first dry day for many weeks. After we'd finished I wandered up Meall a'Bhuachaille via Ryvoan Pass and lovely An Lochain Uaine - the little green lake - which was living up to its name by reflecting the colours of the pines and birches rising above its stony shores. Meall a'Bhuachaille is another fine viewpoint for the Cairngorms and the great pine forests of Strathspey, with Loch Morlich shining amongst the trees. Looking at out this superb vista, as I have done many times before, reminded me of why bodies like the MCoS are important if we want future generations to have the same pleasure. 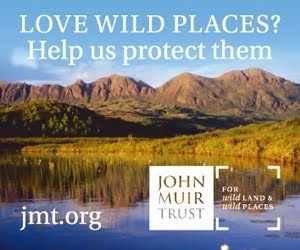 We cannot take the conservation of wild lands or freedom of access to them for granted. The photo shows the view from Meall a'Bhuachaille. Photo info: Canon EOS 350D, Tamron 11-18mm lens @ 11mm, f8 @ 1/320, ISO 100, raw file converted to JPEG and converted in DxO Optics Pro.